Poverty stats equate to cheaper Internet access for schools.The concept is simple: the poorer the school’s student population (based on free-and-reduced-lunch eligibility stats) the greater the discount. It gets more interesting, thanks to Mr. Halbig, whose persistent FOIA requests have likewise begun to pay off. Mr. Halbig sent me a 21-page document with the title “USAC 471 Application” which he received recently. It’s dry as a bone and full of bureaucratic parlance. However, it contains a very intriguing bread-crumb trail. The billed entity is Newtown Schools. The billed entity’s street address is 3 Primrose Street (where the Newtown Schools’ Board of Education is located). The bill pertains to the entire (Newtown) school district. As you can see, we have a problem here. 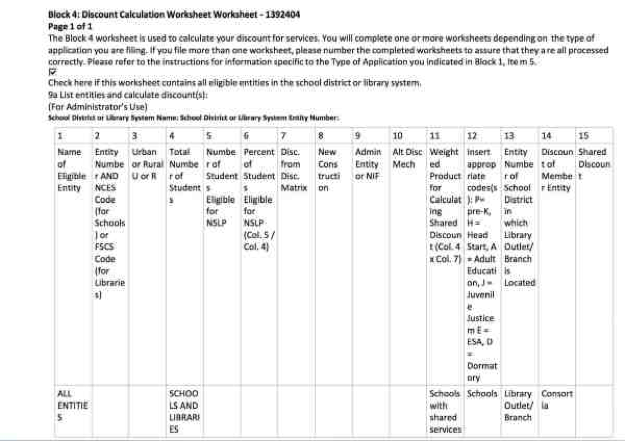 Anomaly #1:Our document of interest concerns E-Rate discounts for Newtown Public Schools. Why, then, is Chalk Hill Middle School, which is in Monroe, not Newtown, listed as one of those schools? So this application was filed, at latest, in April 2012, notDecember 2012. 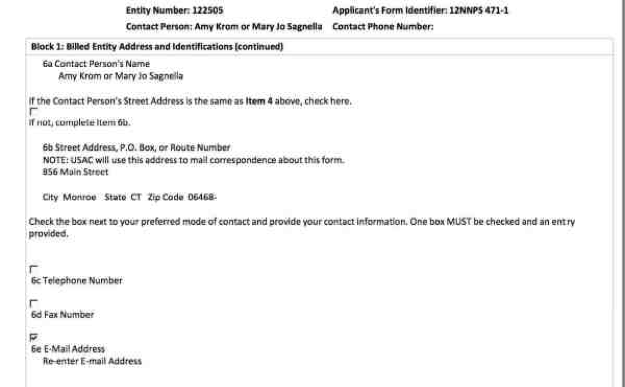 In 2012, Sandy Hook Elementary students were not supposed to be at Chalk Hill Middle School. They were supposed to be in the icky-sticky brick dungeon that used to be Sandy Hook Elementary School. Of course, Mr. Halbig, along with many others, has been questioning that all along. The numbers are the same.The critical number here seems to be the percentage of children receiving free or reduced-rate lunches. It is exactly the same for both schools: 4.223%. How is this possible? The numbers for all of the other schools are unique. There is no such striking sameness! Yet Sandy Hook and Chalk Hill numbers are so completely the same, the schools themselves may as well bethe exact same entity. Could the explanation be that they werethe same entity – not only in 2012, but well before that – when these numbers were being collected and compiled? 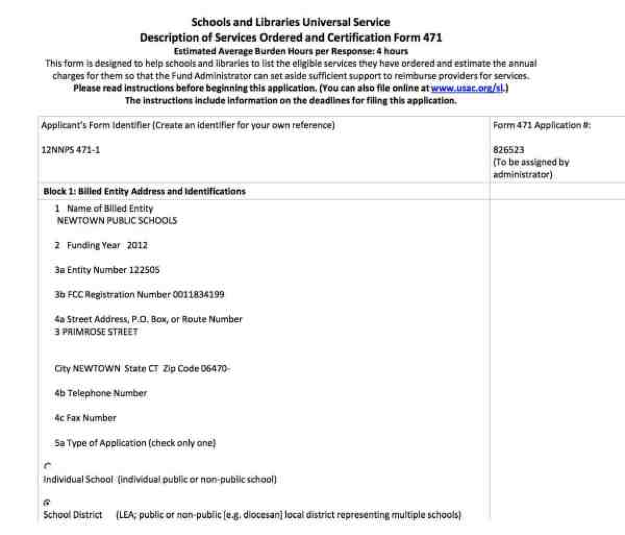 Of course, strangest of all is that Chalk Hill Middle School of Monroe should be included in an application for Newtown Public Schools in the first place. 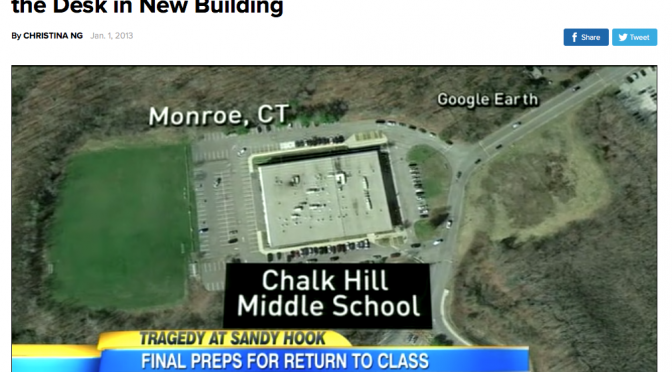 Where were Sandy Hook Elementary students before 12-14-12?Were they already at Chalk Hill Middle School? The evidence above seems to be pointing to that possibility while jumping up and down and shouting. To take that suggestion seriously, let’s consider whether Chalk Hall Middle School was in any condition to house students beforeJanuary 2013, when it rolled out a red carpet and reportedly began creating a Sandy Hook Elementary replica“down to the crayons on the desks” within its walls. Chalk Hill Middle is much younger (built in 1969) than Sandy Hook Elementary (built in 1956). By November 2010, fifth graders had reportedly already been moved out of Chalk Hill(half the school was closed) to Jockey Hollow Middle and there was more talk about “mothballing” the school. By December 2010, the Monroe Schools Superintendent was proposing a one-year closureof the school to save the reported $15MM it would have taken to bring the building’s systems up to par. 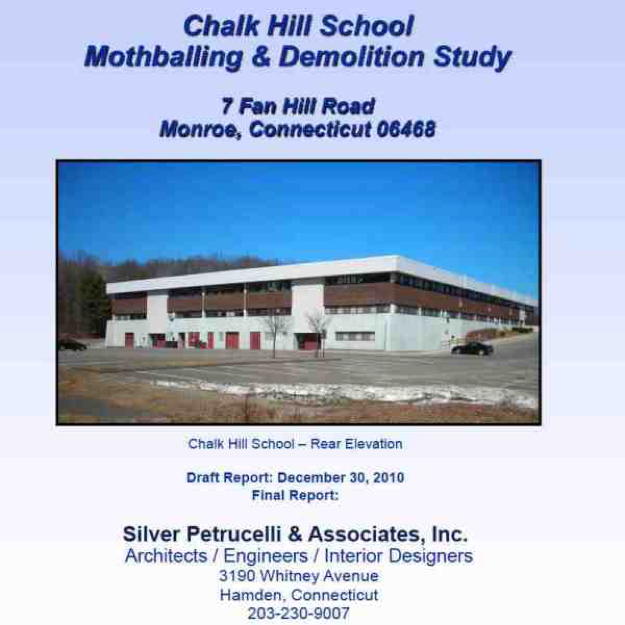 The report recommended mothballing the school to”preserve the structure for future use” (p. 7) as a lower cost option. Demolition would have involved significant costs ($1.9MM) due to the presence of a great deal of asbestos and other toxic materials. According to local media, by June 2011, the school was no longer openand was under the control of the town of Monroe, not the Monroe Board of Education. Mr. Halbig told Cinderella that the Superintendent of Monroe Public Schools said that Chalk Hill Middle School was formally turned over to the town of Monroe on July 1, 2011. The town was no longer seriously considering demolition because the building was judged “structurally sound.” In fact, the possibility of turning it into a community center was still on the table. Then 12-14-12 happened and suddenly Chalk Hill Middle was standing ready with cloned Sandy Hook Elementary décor. Was the school “mothballed” or wasn’t it? It isn’t clear from the MSM reports Cinderella has read. That may be intentional. Where there are crumbs, a school lunch has likely been eaten.There appear to be crumbs all over Chalk Hall Middle School, if the USAC document is to be believed. What do you think? Where do you think Sandy Hook Elementary students were during that critical time (2008-2012) when the Wayback Machine ferret was no longer sniffing at the Sandy Hook school URL? Cinderella was amused by the idea that they were all being harbored at Newtown Youth Academy. See the post here. What a funny idea that was! But funny does not a good hypothesis make. Facts, such as those in the USAC document, rival a good joke any day, such as the one played on us all by the Sandy Hook amateur thespian guild. Crumbs, dear readers, crumbs. Stick to the crumbs.